This content is cross-posted from the EdTechTeam blog. “Whatcha gonna do about it?” I felt like the Universe was taunting me with this question after a challenging series of difficult life events and unexpected changes in rapid succession. In addition to feeling defeated and depleted on a personal level, I was feeling anxiety and concern about the world at large. Every time I turned on the news, scrolled through social media or perused trending topics, I was bombarded with stories that were steeped in negativity. I needed help finding the positive, and looked for inspiration in books, podcasts, online courses, and videos from people who have worked through difficult times with great courage. I noticed that many of them had the same core message, expressed beautifully by Viktor Frankl: “Forces beyond your control can take away everything you possess except one thing, your freedom to choose how you will respond to the situation.” Perspective is powerful. Seeing difficult times as a catalyst for change and growth can help mitigate feelings of helplessness and hopelessness. Instead of perceiving “Whatcha gonna do about it?” as a call to surrender to sadness and wave the white flag, I decided to choose to see it differently – as a challenge to do something good. My response? The Glue EDU. If we focus on the negative, we tend to see more of it. If we look for the positive, it begins to appear more frequently. I decided I wanted to create a blog that focused on the good, that helped myself, other teachers and students work toward becoming more “Wholehearted” (as defined by Brené Brown), and generate a positive ripple as a result. I came up with my site’s mission: We appear to be existing in a time in this world (and often in educational systems) where the focus seems to be on things such as power, programs, policies, politics, plans, and procedures. It feels like decision makers sometimes overlook the most important “P word” of all: PEOPLE! The Glue EDU aspires to be a place where we can share lessons, activities, ideas, resources and more that help us work with our students to become human beings who are courageous, curious, and caring – both to themselves and to others. This could be through mindfulness activities, acts of service, global projects, storytelling, perspective shifting, and more! Many of these activities can harness the power of technology to help us be even more effective and/or wide-reaching. As someone who has worked as a tech integrator for more than a decade, I am passionate about sharing ideas about using technology for GOOD, and teaching our students to do the same. I listen to a lot of people blame technology for many negative things in the world – that we are more connected to our devices but less connected to one another, just for starters. In some instances, this may be true, but I believe we can work to shift our perspective here as well, and focus on all the positive ways we can use our tech tools. I have been incredibly fortunate to attend and present at many EdTechTeam Summits and events where I have seen this demonstrated over and over in presentations by other amazing educators. We can work with students to use technology to inspire curiosity, engage in empathetic interactions, and create, create, create – whether it’s connections to others, stories to share, solutions to problems, or moments of joy. It’s what you do with it that matters – and there are so many ways and opportunities to do it well! It is scary to share your work publicly. When I began The Glue EDU, I worried that my only blog followers would be a couple good friends and my mom. The response has been so much better than I ever expected. Colleagues in my own district are using some of the mindfulness resources I mentioned. Teachers from across North America, in New Zealand, and from Singapore, among others, shared how my post about #eyebombing brightened their day, made them smile, and inspired them to try it with their students. Kids in California are now getting a hug, handshake or high five from their teacher every day. An educator in Ohio reached out to say she made some big connections to the truthbombs I shared and thanked me for writing about them. Knowing that I am creating the positive ripple I had hoped for it gives me the courage to keep posting. Human relationships, empathy, and compassion: they create the glue that connects us. I would love to hear your stories about using technology for good and possibly share them on the blog so others can hear them – your perspective is important and necessary! Let’s use technology to connect our classrooms, share good ideas, and shift perspective to the positive together. Nothing sticks together if we don’t. Please join me! This week I started a brand new school year in a new position at a new (to me) school. For the first two days I was working with all of the students who were also newcomers to the school community. Everyone in the room had a bit of a "deer in the headlights" look on our faces. We were experiencing a lot of new-ness all at one time, and it often felt daunting and overwhelming. There was frustration, exhaustion and a few end-of-day tears shed - and that was just from me: the teacher! A number of colleagues checked in on me to see how I was doing over the course of the week. It was difficult to summarize my feelings, but the best description I could come up with was that it would be similar to the experience that I might have if I moved from my home in Canadia to Australia or Great Britain. On the surface, I would probably think, "It will be an easy transition - I speak English; they speak English. Without any kind of language barrier, I should be able to figure things out quickly, and integration into my new community should be fairly smooth". In reality, I would find out - just as I did in my new school community - that acclimatization into new cultures is never as easy as we think! There are different ways of saying things, alternate ways of doing things, peculiar places to store and locate stuff, acronyms to decipher, slang to decode. Not understanding the meaning of one word in a conversation or staff meeting can lead to cognitive confusion that makes you miss what is being said in the next several sentences, creating further challenges in your ability to put information into context and figure things out quickly. Adapting to all of this requires a lot of brain power, self-regulation, and patience with yourself and others. Feeling like a "beginner learner" this week gave me a huge amount of empathy for anyone experiencing, learning, or even just being open to trying new things, especially our students. Sometimes, as the experienced instructor in the room, we can forget how this feels. Even as a fairly high functioning, mindful adult, I found it incredibly uncomfortable. I could definitely feel how others, especially young students, might find it difficult to overcome the overwhelm in a positive, productive way. Many adults might not even be up to the challenge! Luckily I was able to perspective shift and see how this new situation was forcing me to figure things out and grow - ultimately a good experience - even though it didn't feel like it in the moment. This would not have happened had it not been for one important factor: relationships. People cared about the other people in the building, and this made everything else figureoutable. The staff were kind and accommodating. Students helped me with directions to parts of the building I could not find. Nobody rolled their eyes when I asked a lot of questions; people were patient and helpful. The giant hug I was given by a new student as she left on Friday was one of the highlights of my week. Connection with other caring human beings was the glue that got me through. Thinking about my gratitude for these relationships reminded me of a favourite video, "Every Opportunity", that was created by the Atlanta Speech School. I love how the story in the video depicts "alternate relationship universes" within a school; the contrast is pretty remarkable. 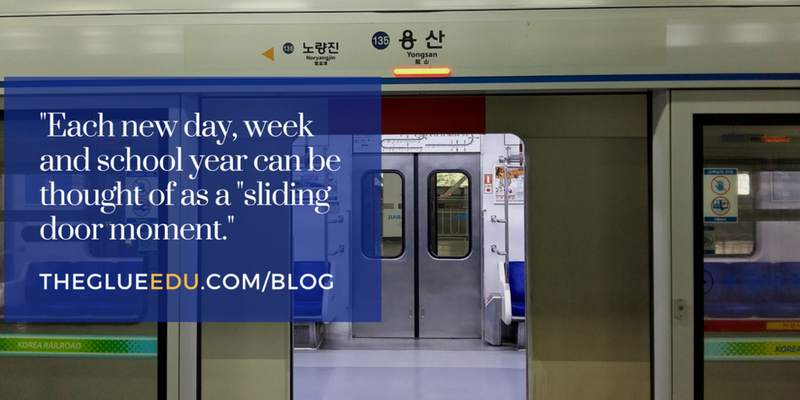 It made me think about how each new school year can be thought of as a "sliding door moment". Every new day and week in your classroom and school can be as well - an opportunity to start over and do better by using what you have experienced and learned. This week was a sliding door moment for me. I resolve to take my struggles and understandings from this first week of school and use them to be more empathetic toward and build better relationships with all the learners I work with this year - both children and adults. Do you have any "sliding door moments" to share? Have positive relationships in your school communities helped you move through some challenging times? Tell us in the comments below or visit our Facebook group and join the conversation there! As humans, when we perceive that there is a threat of any kind, our brain tells our body to enter the "FFF" mode (Fight, Flight or Freeze). Adrenaline and cortisol are pumped through our system, our heart beats faster, our breathing rate accelerates, and muscles in our bodies tighten up, ready to react. A perceived threat can be anything from actual, imminent danger, to something as simple as thinking about something stressful. Human beings are the only animals that can activate the stress response even just by thinking about something that "could" happen - even if it's not really happening, or likely to happen at all. If our brain can think it, our body can react to it. If our brain can make our bodies breathe faster as a response to stress, then it makes sense that if we calm our bodies with deep breathing, then our brain may take this as a signal that it is safe to relax. Even if we are not in a state of stress, a few deep breaths can help us quiet our minds for a moment, increase oxygen to our brains and bodies (which can improve energy, focus and attention), and help us start to develop a practice of mindfulness and being present in the moment. Pausing to take even just three mindful breaths is a simple activity to integrate into the school day, and an easy practice to begin with your students. This could be done in a "no tech" way by ringing a bell when it is time to take 3 breaths, or even by placing post-it notes or other prompts on desks, on books, or in other prominent locations where students will see them as a reminder to pause. There are some excellent websites and tools that can help with this practice as well. Xhalr.com is a simple, web-based tool that gives a visual to breathe along with. Under the menu at the top, right-hand side of the site, you can change settings to adjust the length of in/out breaths, along with types of breathing patterns. Breathe With Me is another simple tool that offers a cute animal and soothing instrumental music to breathe along to. One of my favourite tools is a Chrome Extension called "Breathe". This can be found in the Chrome web store and installed into your Chrome browser. Once installed, you can click on the icon in your extension bar, and set the tool to pop up on your screen at regular intervals to prompt you to take a set number of breaths. I am going to aim to have it pop up on the large screen or SMARTboard in my classroom every 30 minutes to remind the whole class to pause, be in the moment, and take 3 mindful breaths. Have you tried doing mindful breathing activities with your students? Do you have any favourite tools that you would like to share? Please feel free to comment below this post, or join our Facebook group and share your ideas there! As an educator, you are sometimes the only positive adult connection that a student has in the course of a day. Wouldn't it be great if we started and ended every school day on a positive note? I have seen some really terrific videos, like the one below, about teachers who personalize a handshake for each student that they execute as students enter the classroom. It's amazing! I aspire to try this at some point. That being said, busy teacher brains are often taxed to the max, making it challenging to easily remember complicated patterns and creative gestures, so a simpler approach might be good to begin with. My goal for starting this school year is to offer these three choices to my students each day as they enter the class in the morning, and as they leave at the final bell. What are your thoughts? Do you have any routines or traditions which foster a positive sense of caring and connection with your students to begin and/or end the day? Please share in the comment section below!